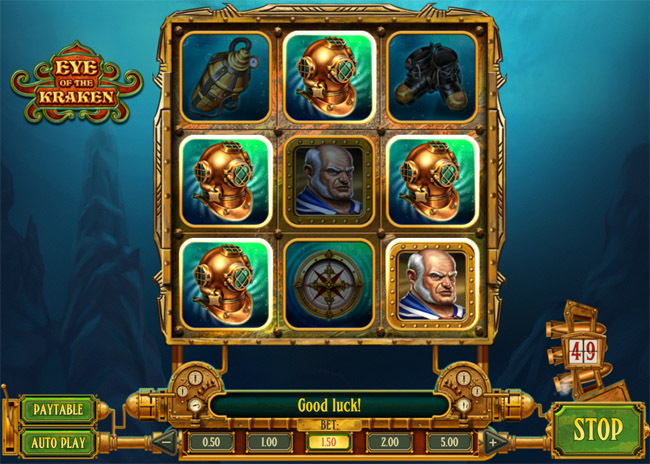 As you can guess from the title Play n’ Go has found an inspiration for this video slot from the legendary sea monster. Kraken is a cephalopod-like monster you will come to love despite his scary appearance. Eye of the Kraken comes with 3 x 3 reel grid, 8 paylines, and 3 amazing special feature. Who would have known that this sea monster is so generous?! 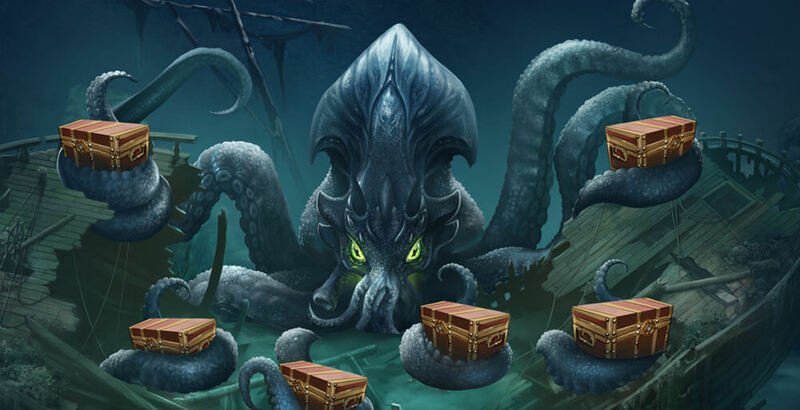 As you enter this video slot, Kraken’s image is the first thing to see, and you’ll never forget his eyes. Eye of the Kraken is an ocean adventure and thanks to the background, with ocean bubbles and small fish swimming around, you’ll have a feeling you’re in it for real. The blue color is dominant, but you’ll see a few golden details, and witness great animations Play n’ Go is truly proud of. The soundtrack is very effective and it definitely emphasizes the tension of trying to find the hidden treasure and escape the monster. Even though you’ll naturally fear this fierce creature, when you see him appearing out of nowhere and shaking the reels before he puts his hand around it, you will be happy with the final result. That’s because the Kraken represents the Wild symbol in this game, and it’s obviously there to help you win more cash or real money. It can replace any symbol to help you create a winning combination unless it’s the Scatter that’s missing. Besides the Wild symbol, which is the main character, a few other significant people will also stand beside you throughout this adventure and bring you up to 1000 coins. The scientist, a pilot and the captain of the ship along with their equipment, diving helmets, and compasses, represent amazingly designed symbols. This adventure wouldn’t be possible without diving boots, harpoons and air-tanks, which pay out decently. Obviously, the eye of a Kraken is the most valuable symbol you’ll always be happy to see on the screen. 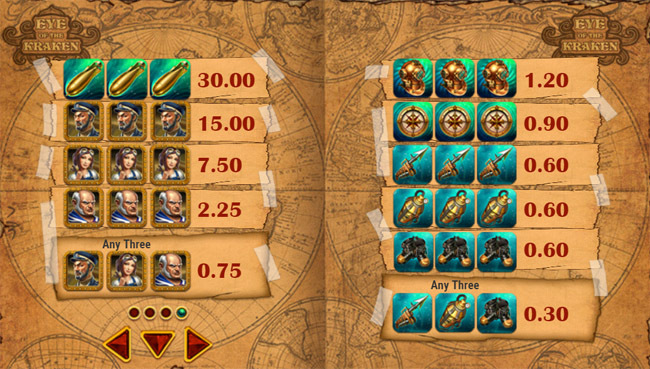 Conquer the Kraken is the special feature that will bring you a lot of excitement and up to 500 x your stake. This feature will be activated once you find 50 torpedoes you’ll need to fight the Kraken. You can aim any of his tentacles because each of them is very valuable, but hitting all of them is definitely worth some unimaginable rewards. Dive Mode is another interesting feature you can trigger by landing 5 diving helmets on active payline. It results in 9 free spins for you and you get to dive and collects Scatters. If you find 9 of them you can win up to 150 x your stake, as Scatter wins are multiplied by the total bet staked. Last but not least, the Wild Kraken tentacles are so powerful because they can turn any symbol into the Wild. This means that your winnings will increase and you also have a chance to win 10 x your stake if you land identical symbol in all four corners of the grid. Eye of the Kraken video slot is so amazing because you get instantly involved with everything that is happening on the screen and in Kraken’s company, it’s never monotonous. If you decide to spin the reels in the depth of the ocean, your quest for treasure won’t be easy, but Wild, Scatters, and special features are there to make your life easier and your payouts higher.